Every person has a right to contribute to their family, community, and society as best they can. Human dignity and self-determination come, in part, from being able to participate in functions that sustain and enhance life. Life-enabling functions - in addition to acts of love, sharing, art, and nurturing - also include productive and service-related activities often referred to as "work." As our profit-hungry global economy overshadows sustenance based on caring and sharing, more and more aspects of production and service are performed as jobs for pay. Today's money-minded value system - "You get what you pay for" - is systematically marginalizing deeper human values, and the most vulnerable human beings. Nevertheless, many life-sustaining human activities are still founded on love and sharing. The majority of productive and service-providing work is still done without pay, much of it by women and children in the home. Many disabled people, too, find ways of contributing to the well-being of family and community that are unpaid, yet life-affirming. Rural areas. In traditional farming societies, survival still largely depends on growing and gathering food, hauling water and firewood, and other physical activities. So physical ability tends to be highly valued (sometimes more than mental ability). 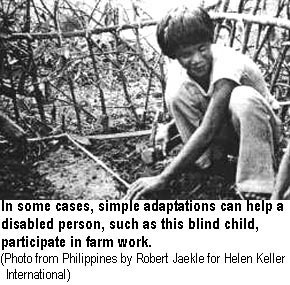 In terms of fitting into the life and production of the community in rural areas, a child with a mental disability may be less socially handicapped than is the child with a physical disability. GOYO, a boy with Down's syndrome in Ajoya, the village where PROJIMO is located, regularly went with his father to the fields. Helping to plant and gather maize (corn) and to cut weeds was repetitive work the boy could learn and do well. He took pride in helping his family. During the long dry season when there was no farm work, Goyo helped to earn a modest income for his family by hauling water from the river for neighbors, in large tins on a donkey. Other boys disliked this hard repetitive work, but Goyo did it with pride. Hauling water was his livelihood until the village modernized and obtained a gasoline pump that piped water into the homes. Urban areas. In cities, successful integration into society often depends more on mental ability than on physical fitness. Especially for the mentally slow child, schooling may be a major hurdle. A youth who does not graduate finds it hard to find a paying job, even doing physical labor. For these reasons, although in rural areas more concern is often shown for people with physical disabilities, in urban areas there tend to be more programs for children who are mentally handicapped. In the mushrooming cities of the world, unemployment is a growing problem. Giant industries, in pursuit of "cost effectiveness" (higher profits), are "down-sizing" (replacing workers with machines). Today, so many persons are job-hunting that it is often hard for disabled persons to compete. Since Mexico's entry into the international free market economy, thousands of small businesses have closed down. Even university graduates and licensed professionals - doctors, lawyers, engineers - beg coins on street corners by selling trinkets or by performing as fire-breathers and clowns. In today's world of rising joblessness and falling wages, it may be unrealistic to routinely train disabled people for jobs in the formal economy. It often makes sense to help them learn skills within the informal economy: producing things at home or in neighborhood collectives that they can sell directly on the street or in a stall at a community market. 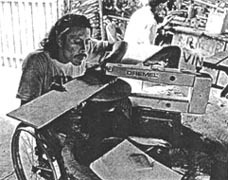 Several rehabilitation programs that used to train disabled persons for skilled factory jobs, such as operators of lathes and heavy machinery, have changed their approach and now focus on teaching disabled persons skills that enable them to be self-employed or to work in small worker-run cooperatives. 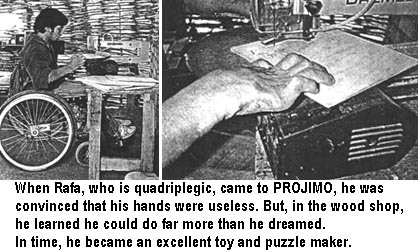 At PROJIMO, disabled persons are able to learn a variety of skills, mostly in the form of apprenticeships, or learning by doing. Some of these skills are related to providing health, medical, and rehabilitation equipment and services to other disabled persons. Other skills are learned as part of income-generating activities. These skills range from the production of various articles for sale, to the management of the village small-goods store, to running a modest welding service or carpentry repair shop. The production of these items serves three main purposes. 1) It provides skills training and productive activities for the disabled people involved. 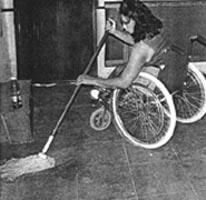 2) It produces some income for the program and modest wages for the disabled workers. 3) It provides disabled persons with work experience, so that when they return to their homes they can set up a small workshop there and help to support themselves and their families. Home-making skills. PROJIMO provides an environment where young people can perform a variety of home-making skills, ranging from cooking to house-cleaning to laundry. Because the disabled participants run the group kitchen, plan meals, and buy the food, they acquire skills in home economics, learning by doing (and learning from their mistakes). The Model Home, built by disabled participants with help from the local community, is a disability-adapted, low-cost, mud-brick building. It has many features to help persons with different disabilities be able to keep house more easily. Disabled persons who live temporarily in the model home while visiting PROJIMO can try out its different features, and get ideas for modifying their own houses. Adaptations range from a completely wheelchair-accessible kitchen, to bedrooms with hand-grips hanging from the ceilings for getting in and out of bed. Next to the model home is an outdoor wheelchair-accessible laundry area. 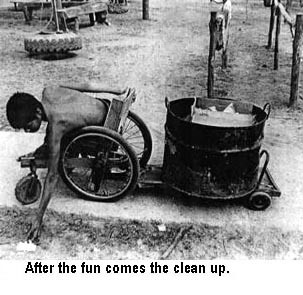 Getting disabled boys and men to help wash dishes and clothes has been a big challenge, but the adapted facilities make it easier. Skills learned in making assistive equipment can be applied to many kinds of community work. 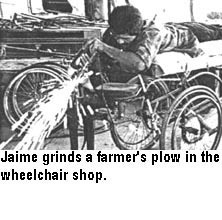 On page 259, we gave the example of how the wheelchair-making shop turned into a village repair service where farmers came to repair their broken plows, and children their busted bicycles. 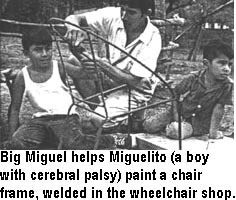 As another income-producing venture, the workers in the welding shop began to make metal chair frames from metal building rods (re-bar). 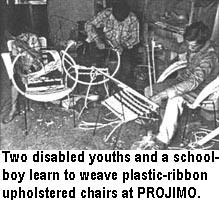 Other disabled persons learned to weave the chairs with plastic ribbon. These woven chairs sold well in local villages. One boy, Rubén, later set up his own chair-weaving business at his home, and soon earned twice as much as his brother in a factory. 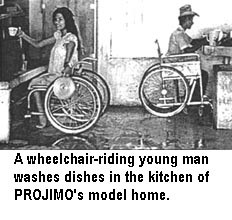 Disabled people helping one another provide a lot of the skills-learning at PROJIMO. Some young persons who first came for their own rehabilitation have stayed on at PROJIMO to learn the craft, organizational and rehabilitation skills that most interest them. Several have become very capable therapy-workers and craftspersons. 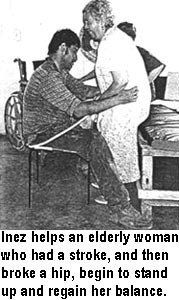 One example is INEZ, who first came as an abandoned street child, with one leg paralyzed by polio. Inez has become a skilled therapy worker, having been taught by visiting physical therapists. Inez became such a capable therapist and rehabilitation worker that, after a few years at PROJIMO, he set up his own successful physiotherapy practice in the city of Mazatlán. In time, however, he gave up the private practice and returned to PROJIMO. He preferred working as part of a community-based team to help those with limited resources. Inez married another PROJIMO worker, Cecilia, and has two energetic daughters. 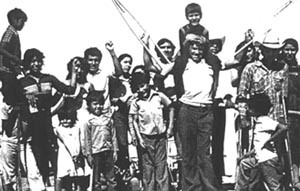 With a disabled child on his shoulders, Inez raises his crutches in a sign of victory. This scene is from a village theater skit to raise public awareness about the potential of disabled persons. 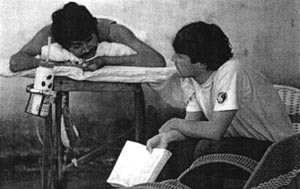 It portrays Inez's own story: how he first came to PROJIMO as a boy for rehabilitation, and later became a skilled therapist helping others. 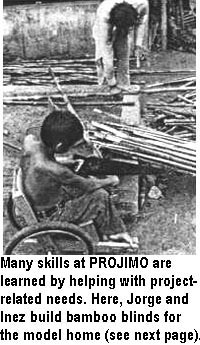 Carpentry skills.The PROJIMO wood-working shop is where many disabled youth apprentice in making all kinds of equipment for disabled children, ranging from special seating and standing frames to educational toys. With the skills learned in this shop, some of the disabled young people have gone on to set up their own carpentry shops. Others have joined rehabilitation programs where they can put both their carpentry and rehabilitation skills to good use. 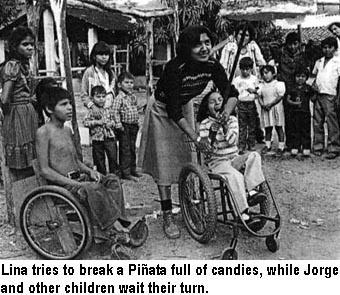 Marielos, who is paraplegic, makes a special standing frame for a child, who watches with interest from his mothers arms. Marielos also makes doll-house furniture, for which she has more requests for sales than she can meet. Mario, a street youth who became paraplegic from a bullet wound in the spine, learned carpentry skills while helping to make special seating and other equipment at PROJIMO. But what makes Mario an outstanding worker is his heartfelt understanding and concern for the children he works with (see page 270-271). Here, he adapts a support for a girl whose leg is casted. 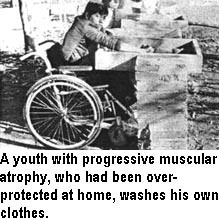 Even some of the young people who are quadriplegic (with paralysis of their arms and hands as well as legs) have become skillful carpenters and toy makers, The first obstacle for them to overcome is their feeling (and fear) of incapacity. The beauty of PROJIMO is that new-comers have excellent role models to follow. They dare to try new things and to test - and stretch - their limits. Conchita Lara, with Mario's help, works on the monthly financial report of PROJIMO. For more about Conchita, see Chapter 42.
Business skills. Several disabled persons at PROJIMO who collectively run the program have also learned some organizational skills, and also book-keeping. 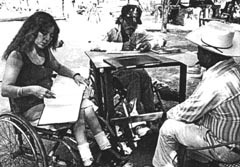 Conchita studied accounting before she became paraplegic. Now she is a coordinator of the program and manages the financial records. She has taught other workers to help with accounting and program records. These skills can be useful for those who later set up their own small workshops or cooperatives. Video skills. Some work opportunities are unplanned. The PROJIMO team decided they should make educational video-tapes of aspects of rehabilitation and therapy where movement is important, and where words and drawings are not sufficient. So they raised money to buy a video camera and recruited a skilled filmmaker to come teach them how to use the equipment, and put together and edit a film. Mari and Conchita, the two main coordinators of PROJIMO, mastered these skills. Video cameras and film making was a new and exciting event for the local villagers. There are 3 or 4 video cassette players in town. Local people begged to have pictures taken of themselves and their families. 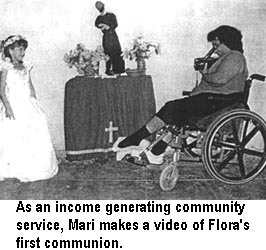 Having acquired the needed skills, Conchita and Mari soon found themselves invited to take videos of events such as baptisms, weddings, and the coming-of-age parties of 15-year-old girls. Making and editing of videos has become one of the more successful income-generating activities of PROJIMO. Maintaining PROJIMO's grounds and buildings. The maintenance of PROJIMO provides skills training and practice at a range of tasks useful for maintaining a home or business. Cecilia, who is now married and runs her own household, helps to clean up PROJIMO's consultation room. 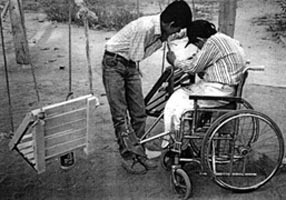 Heliodoro, who is paraplegic, helps Inez repair the project water pump, and in the process he learns a useful skill. 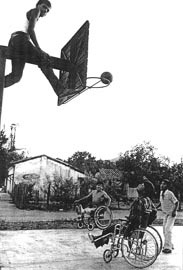 The Spanish Language Training Program run by disabled villagers. For persons whose disabilities extensively limit the use of their bodies and hands, finding work opportunities can be quite a challenge. This is especially true for those who have little or no formal education - which is often the case. 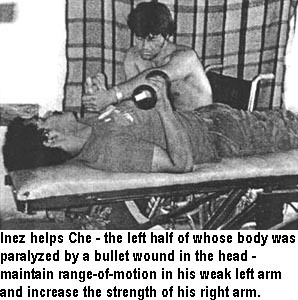 Quique, who was quadriplegic, had almost no control of his hands. He was one of the teachers in the Intensive Spanish Language Training Program. Here, he is teaching an idealistic young North American physiotherapist. 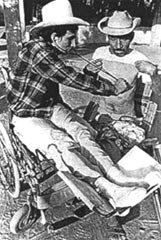 He is lying on a wheeled cot, or gurney, to allow the pressure sores on his backside to heal. VICTOR, a young doctor, gave PROJIMO one of its biggest rehabilitation challenges. Soon after graduating from medical school, Victor broke his neck in a car accident. He spent months in a hospital, where he developed pressure sores and urinary infections. He had become suicidal. He was sure he could never work as a doctor. Note: The different work activities shown in this chapter represent only a few of many possibilities. We have focused on some of the more innovative examples, mostly from PROJIMO. Clearly, the examples shown here only touch the surface of what is possible.